PRESENTATION — Students from Mrs. Mauri’s Criminal Justice class and Mr. Mellows’s Political & Legal Education class at Bayonne High School are here with their teachers and Director of Community Engagement, Mr. Rudy Snelling, and Chief of Staff, Mrs. Carol A. Lamparello, from the Hudson County Prosecutor’s Office. 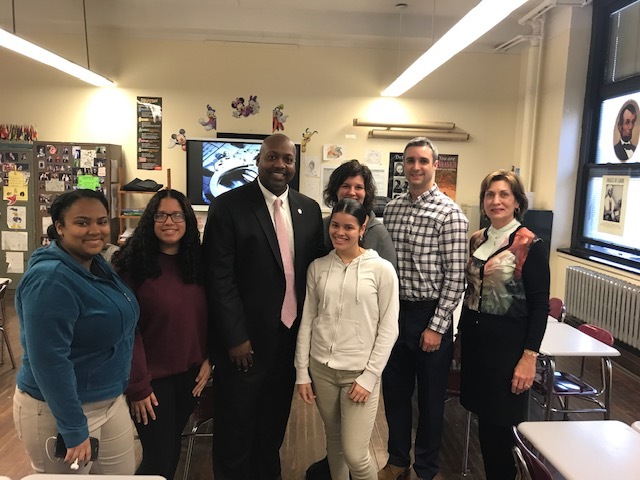 Mr. Snelling, a former detective with the Jersey City Police Department, visited Bayonne High School to give a presentation on gangs. This presentation was the third in a series of talks given by representatives from the Hudson County Prosecutor’s Office. Director Snellings’s visit is also part the Social Studies Department’s initiative to provide even more authentic and engaging learning experiences for students in elective courses.